I’ve just had the craziest weeks of my life, I think. I’ve been so busy with the Committee, doing background memos for Staff Delegations, writing reports on different things, and doing front desk work. I’ve learned so much this semester, which I finally realized this week. Class on Tuesday was the epitome of amazing-ness. The whole day had been great, because I got to see a friend for lunch, and work was plentiful. In class, we had a speaker from the Department of State talk to us about S/CRS and the Civilian Response Corps. I realized as I was listening to him talk that I really knew my stuff when it came to nation building operations. Instead of feeling uninformed and confused, I was completely aware of all the procedures and bills he talked about, and I was more than a little upset by the lack of awareness he seemed to have on interagency cooperation. I almost felt like I should have been lecturing HIM on the importance of integrating efforts from government agencies and the Defense Department, and learning from your history. Instead, I listened, and asked questions about efficacy of CRC coordination with military units, given the previous issues PRTs had in the field. The whole class seems to have become experts as well, which is great. We can have conversations at amazingly high levels about various aspects of post-conflict reconstruction, including the problems and advantages of various methods for combating problems. I want to do this forever. I have been sucked in to the defense and aid coordination field. 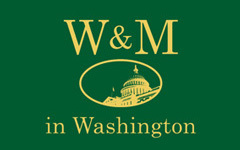 Part of me really wishes I could finish my William and Mary degree in DC so that I could keep working on the side. I feel like I could be valuable already in that career field. I don’t know if I’ll be able to go back to just studying and taking exams for another year. Anyways, extracurricular life is going swimmingly too. I missed a Committee happy hour last week for class, but it’s okay because I’ve gotten to spend a lot of time socializing with Committee members lately. Now I’ve got to get back to work, though. I have an addendum to a class article due tomorrow. I’m writing on clans in Central Asia and their implications for stability in countries…I have about 4 pages left! I’ll update later this week!